We reported our financial results for the 3rd quarter of 2018. The results showed a positive operating performance for our subsidiaries, strategic decisions to not participate in some businesses, and external issues such as the volatility of capital markets. In particular, during the third quarter there was a negative foreign exchange effect due to the devaluation of the Colombian peso vis-à-vis the dollar. The company’s net income YTD were COP 1.1 trillion (USD 371.9 million), a 0.7% increase compared to the same period during the previous year. This is the result of a 7.7 increase in net income for SURA Asset Management, to COP 479,288 million (USD 161.3 million), and 0.5% for Suramericana, for a total of COP 394,843 million (USD 132.8 million), and a recovery, during the third quarter, of the revenue through the method of participation of associates due to improved results for Bancolombia and Grupo Nutresa. Total revenue came to COP 14.5 trillion (USD 4,480.5 million), a decrease of 4.3% that reflects issues such as the decision to not participate in pension insurance in Colombia, Lower revenue from the investments in the portfolios of the subsidiaries, and the devaluation in Argentina. These factors have been partially offset by higher revenue from commissions for the pension business, and the provision of health services in Colombia. 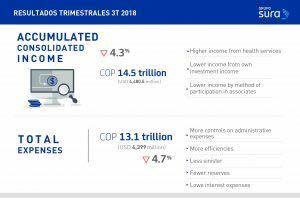 Meanwhile, total expenses were COP 13.1 trillion (USD 4,399 million), a decrease of 4.7%, and tend to decrease faster than revenue. This reflects fewer claims and reserves, control of administrative expenses, and decrease in interest expenses. “We would like to stress that we continue on the path of accelerating profitable growth with positive performance by Suramericana and SURA Asset Management. Both subsidiaries are growing in their main segments and at the same time maintain a focus on efficiency, and make investments to strengthen their operations. The final results are affected by external factors, such as lower income from investments, due to the volatility of the capital markets, and the impact of the rates of exchange”, commented Ricardo Jaramillo, Vice President of Corporate Finance for Grupo SURA. SURA Asset Management, our subsidiary expert in pensions, savings, and investment, has a 6.6% increase in revenue from commissions in its mandatory pension business, while the voluntary savings business rose by 15.1% in comparable terms. It had a total of 19.8 million clients, an annual increase of 3.6%, while assets under management (AUM) represent COP 412.8 trillion (USD 138,897 million) and grew 7.5% compared to September 2017. These figures are consistent with the strategic focus on strengthening the client’s experience, and the processes related to the savings and investment decisions. In turn, Suramericana, our subsidiary specialized in insurance management, trends and risks, had increase revenue, in comparable terms, from all its segments: general (8.1%), life (13%), and health (20.5%). In addition, the rate of retained claims improved by going from 55.5% to 54.3%, and technical results increased to 8.3%, in spite of the decrease in premiums for not participating in retirement insurance in Colombia. The Company continues to adjust his portfolio of solutions to increase efficiency, control claims, and increase business activities in segments such as small and medium-sized companies. Just between July and September, net income for Grupo SURA totaled COP 413,588 million (USD 139.2 million), 10.2% less than the third quarter of 2017. The decrease is due to the impact of the difference in the rate of exchange, although these are the highest net profits for 2018. Suramericana’s profits increased, for the third quarter, by 33.2%, while profit for SURA AM decreased by 2.6%, as a results in differences in the rates of exchange. 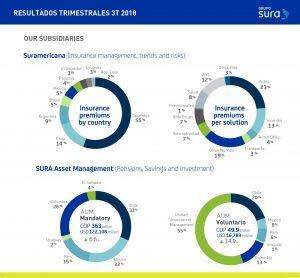 Grupo SURA closed the 3rd quarter of this year with the assets for COP 67.9 trillion (USD 22.866 million), 1.5% less than December 2017; liabilities decreased by 1.4%, to COP 42.2 trillion (USD 14,186 million), and equity decreased by 1.6%, ending at COP 25.8 trillion (USD 8,681 million). For the 8th year in a row, Grupo SURA is part of the world selection of companies that make up the Dow Jones Sustainability Index (DJSI). 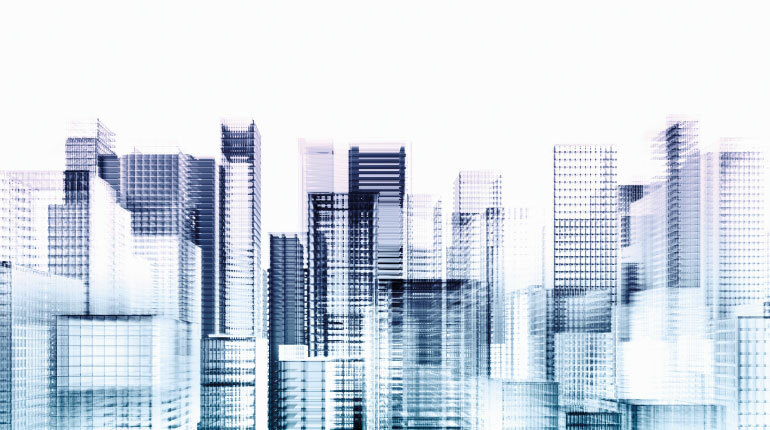 It had the third highest score among the 15 companies in the Diverse Financial Services and Capital Markets sector, and is still the only Latin American company in that sector. Seguros SURA Mexico, an affiliate of Suramericana, began the orderly transition to incorporate the Life solutions business managed by SURA Asset Management in that country, after obtaining the approval from the regulators. The operation is part of the strategy to optimize Grupo SURA’s portfolio to reinforce opportunities for growth and efficiency in both affiliates. As part of SURA Asset Management’s digital transformation and use of exponential technologies the company launched Protección Smart in Colombia, a robot platform that uses analytics and artificial intelligence to design a customized investment platform for those who wish to save in voluntary funds. In addition, it can review each day the strategy that has been defined, and optimizes the combination of portfolios to achieve the goals of each saver’s plan. A report from Morningstar gave, in Mexico, its highest score to the four investment companies specializing in retirement funds (Sociedades de Inversión Especializadas en Fondos para el Retiro - Siefores) managed by Afore SURA. They were the only ones in that country to get the Morningstar analyst silver rating, the highest awarded this year, according to the report published in early October by that global investment research and management firm.